Egg rolls have always been one of my favorite side dishes. 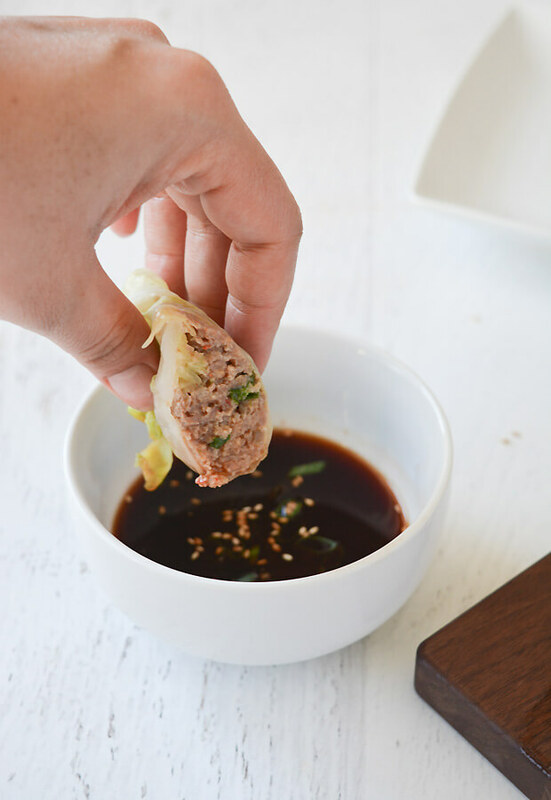 I’ve been finding new ways to use cabbage lately and had the idea to make these steamed pork cabbage rolls. 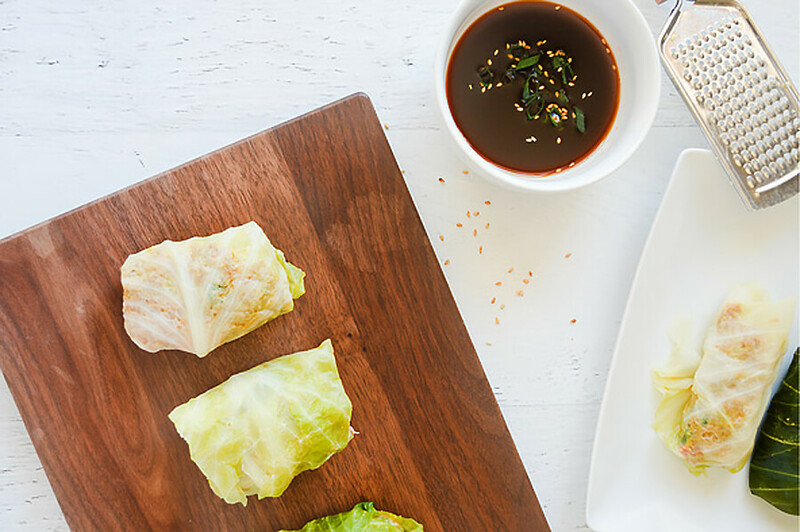 Instead of putting shredded cabbage inside, the cabbage makes a great roll filled with savory ingredients and a bit of spice from freshly grated ginger. These don’t have a fried layer like a traditional egg roll, but that doesn’t make them any less flavorful! 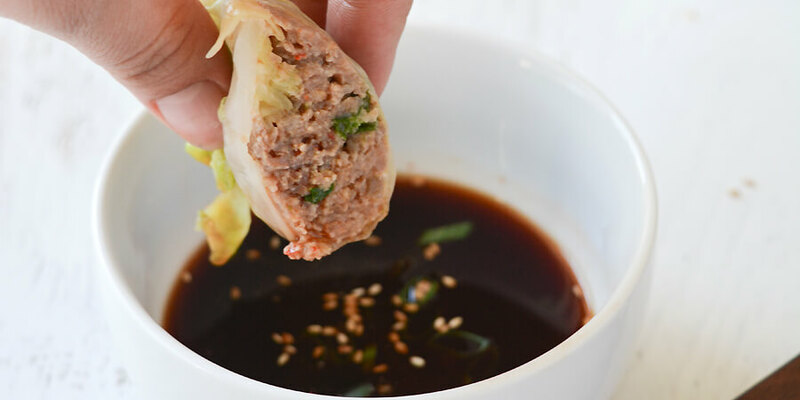 The dipping sauce is optional, but it adds a burst of spice that completes the flavor of the rolls. Keep in mind the rolls are steamed, so when you bite into them you’ll get a nice and tender crunch. For this recipe, you’ll need a steamer basket, vegetable peeler, and grater. If you don’t have a steamer basket, a metal strainer that fits over your pot and hooks onto the side will work as long as you are able to keep the food elevated out of the water. 1. Pre-heat a large pot of boiling water on the stove. Slice green onions into strips. 2. Cut the stem off the cabbage and carefully peel off the leaves. Place cabbage leaves into boiling water until they begin to soften. Use tongs to pull out the leaves then set aside. 3. 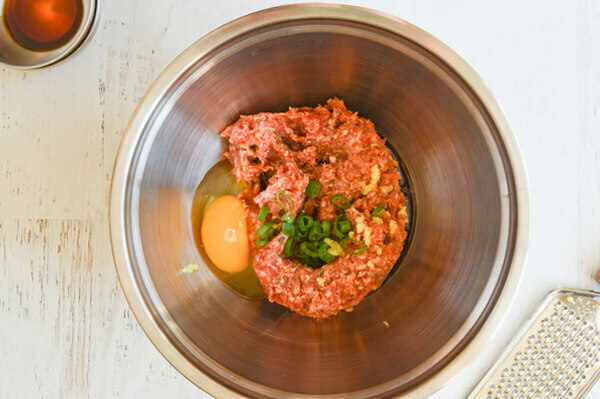 Place the ground pork in a large mixing bowl. Add egg, soy sauce, and green onion to the bowl. Peel ginger with a vegetable peeler, then grate it into the bowl. Mix everything together. 4. Place 2 heaping tablespoons of the meat mixture on a blanched cabbage leaf. 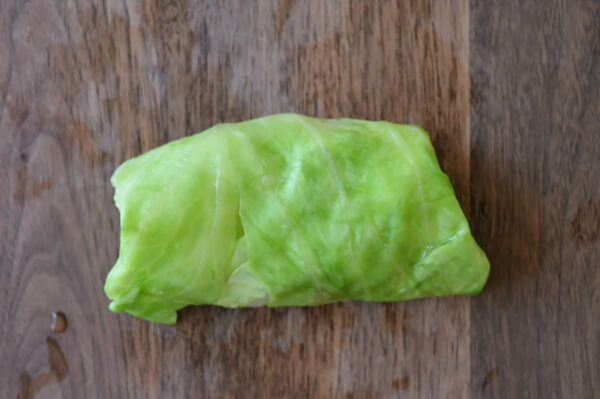 To roll the cabbage leaf, press the bottom up about one-third of the way towards the top of the leaf, covering the meat. This will be the thickest part of the leaf. Depending on the size of the cabbage, adjust the amount of meat if necessary. It should be full, but not overly stuffed as that will drastically increase cooking time. 5. Fold the left and right sides towards the center. If it tears a little, the upper part of the leaf will cover the small tears while completing the roll. 6. Once sides are tucked, roll forward like a burrito into the rest of the leaf, tucking in uneven pieces as you go. 7. Place pork cabbage rolls onto steamer rack and place into pot with boiling water. Water shouldn’t be touching rolls but have enough to boil and create steam. Place a lid on the pot and allow to steam for 20-25 minutes or until meat is cooked through. Rolls will be firm to touch when cooked. Remove from the pot to cool. 8. Whisk the soy sauce, salt, sriracha sauce, erythritol to create the dipping sauce. Serve warm with dipping sauce. 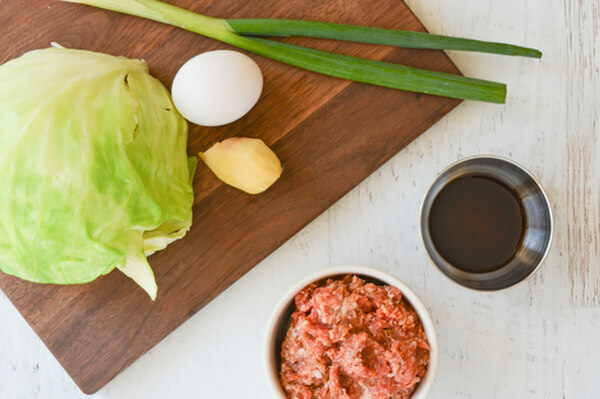 This makes a total of 8 servings of Steamed Pork Cabbage Rolls. Each serving comes out to be 191.6 Calories, 12.67g Fats, 1.86g Net Carbs, and 17.05g Protein. Pre-heat a large pot of boiling water on the stove. Slice green onions into strips. 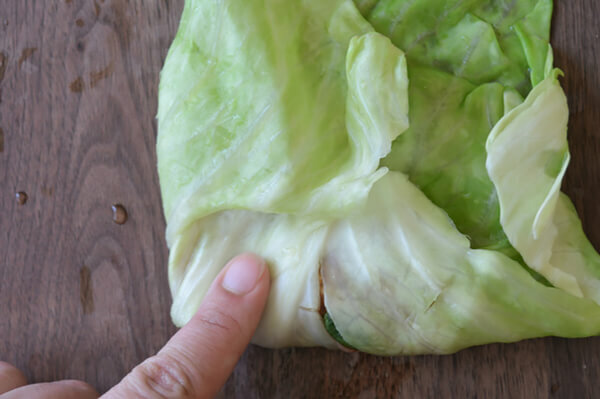 Cut the stem off the cabbage and carefully peel off the leaves. Place cabbage leaves into boiling water until they begin to soften. Use tongs to pull out the leaves then set aside. Place the ground pork in a large mixing bowl. Add egg, soy sauce, and green onion to the bowl. Peel ginger with a vegetable peeler, then grate it into the bowl. Mix everything together. Place 2 heaping tablespoons of the meat mixture on a blanched cabbage leaf. 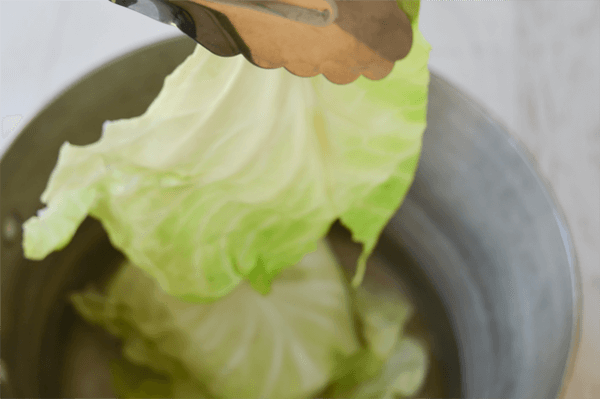 To roll the cabbage leaf, press the bottom up about one-third of the way towards the top of the leaf, covering the meat. This will be the thickest part of the leaf. Depending on the size of the cabbage, adjust the amount of meat if necessary. It should be full, but not overly stuffed as that will drastically increase cooking time. Fold the left and right sides towards the center. If it tears a little, the upper part of the leaf will cover the small tears while completing the roll. 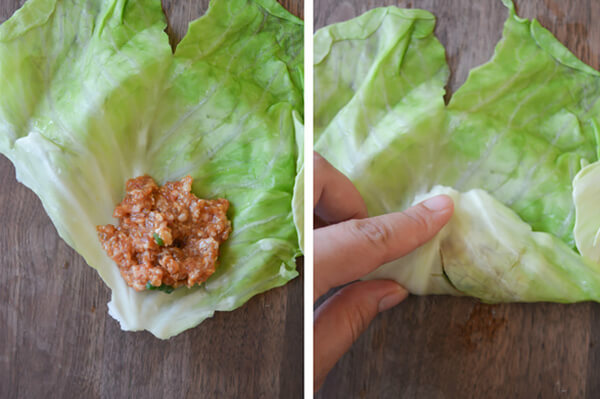 Once sides are tucked, roll forward like a burrito into the rest of the leaf, tucking in uneven pieces as you go. Place pork cabbage rolls onto steamer rack and place into pot with boiling water. Water shouldn’t be touching rolls but have enough to boil and create steam. Place lid on pot and allow to steam for 20-25 minutes or until meat is cooked through. Rolls will be firm to touch when cooked. Remove from the pot to cool. Whisk the soy sauce, salt, sriracha sauce, erythritol to create the dipping sauce. Set aside.